Christmas is approaching and you all must be busy doing preparations for it beforehand. The level of excitement and happiness keeps on going up as the days pass by. Lots of things are to be done! You have to go for shopping, like lots of shopping, bake cakes, eggnogs, doughnuts, Christmas pudding etc, buy lots of decorative items for the big X-mas tree. Buy presents for each other, and the most important is receiving gifts from the much admired Santa Claus among children. It has become like a ritual during Christmas. Yes our very own photos. How can we ever live without posing for some good pictures and have lots of memories of every passing Christmas eve. Selfies are a new addiction among everyone. And Christmas is a perfect day for taking many pictures. And how can we forget the tradition of a family photo. A camera to put on timer, making everyone ready for the perfect pose and setting up the camera on the tripod, the right way. All these things are to be done when this important ritual is carried out. Here in this video Tyne Owen, a New South Wales resident, decided to hide a secret message in this video, a video of the grand gesture. 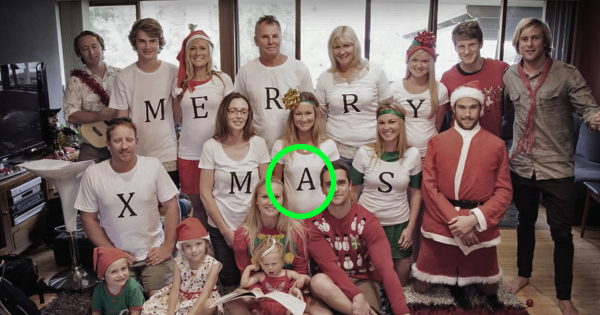 All the members of the family wore T-shorts spelling an alphabet on each of them. It reads MERRY XMAS. Nothing comes to one’s mind while looking at the picture but see what happens when his girlfriend successfully decodes that message. Watch carefully every movement of the girl wearing the A T-shirt.